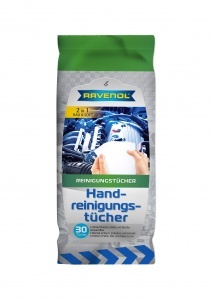 RAVENOL Hand Cleaner Wipes are antibacterial wet wipes made from a special fleece material designed for cleaning, caring for and protecting the hands whilst neutralising odours. Their compact packaging makes them ideal for use either on the go or at home as they fit into every glove box and are therefore close to hand at all times. Open the flap, remove the wipe, close the packet. Clean your hands thoroughly with the wipe. In order to avoid the wipes drying out, reclose the packet directly after use.